Thursday night was my first time inside the Jewish Community Center’s Linker Auditorium where the Center Stage company performs. Like many of you, I’m sure, I have for years been aware of the activities at 3600 Dutchman’s Lane, but had never taken advantage of them. Now that I have broken that barrier I plan to be a regular attendee. Jill Sullivan, Ericka Gibson and company. Artistic Director John Leffert has put together a strong season of sure-to-please hits that opened last week with the 2002 hit Hair Spray. This is an ambitious undertaking that requires a full complement of more than thirty triple-threat performers. 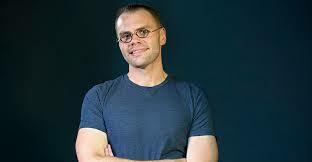 Leffert also put together a six-piece band led from the keyboard by music director Chris Bryant. The horn section struggled a little at the performance I saw but the band was otherwise solid throughout. The company is led by Jill Sullivan as Tracy Turnblad, a chubby teen who overcomes the prejudices of television producer Velma Von Tussle, played by Annette McCulloch, to become a dancer on the Corky Collins Show. Corky is a smarmy, but savvy visionary as played by Mike Fryman. Unfortunately for McCulloch, Fryman and the company at large their performances were marred by intermittent sound problems ranging from dropped cues to poor design. The latter of these could be easily remedied by a quick trip the Doo-Woop Shop. The inexpensive rental of a couple speaker towers positioned on either side of the thrust stage would do wonders for the show’s audibility and would take care of the feedback problems that occasionally overwhelmed the performers. Back to the story. For those of you who haven’t seen Hair Spray in any of its incarnations, Tracy leads a revolution to integrate Corky’s show, while questing for the heart of Elvis would-be Link Larkin, played by the very talented Chad Broskey, and raising awareness of the need for positive body image among teenage girls. Tracy’s sidekick and best friend is the nerdy Penny Pingleton, played by Hannah Gregory who absolutely steals every scene with her strong character choices, and effortless performance. 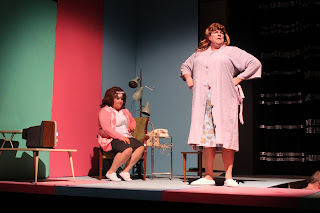 John R. Leffert as her mother, Edna Turnblad. 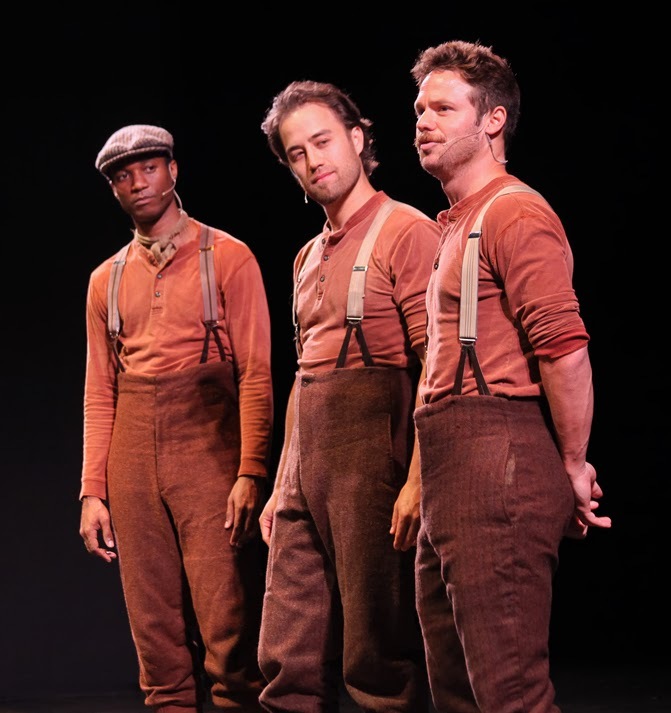 The work this company has put in with Choreographer Zachary Boone is obvious on stage. Boone has created visually exciting numbers that us the limited space to its full potential. It is a joy to watch talented dancers throw off complex choreography as if it were nothing. The ease with which Dallyn Brunck, who plays Tracy’s nemesis Amber Von Tussle, sings and dances her way through “Cooties” was nothing short of amazing. One of the most controversial songs in Hair Spray is the eleven o’clock number, “I Know Where I’ve Been,” and low-down R&B heart-ripper sung by a secondary character, Motormouth Maybelle the African-American DJ who serves as counterpoint to both Corky Collins and Tracy’s mother Edna (more on her in a minute). As Motormouth Tamika Skaggs wows the audience with her powerful interpretation of this this song that, for that moment, brings to bear the heartbreaking impact of institutionalized racism. Artistic Director John Leffert himself takes on the role of Edna Turnblad, originally played by the flamboyant drag queen Divine who appeared in several of John Waters’ early films. The character has also been played on stage by the great Harvey Fierstein and on film by John Travolta. Leffert walks a fine line as the organizational leader, and I think he is holding back to avoid the appearance of upstaging anyone. This is unfortunate, because the joy of Edna is her oversized, larger-than-life presence. What Leffert gives us is great, but left me wanting more. As I said this is a large cast and I could easily give compliments to each member of the company for their performance. Ericka Gibson as Little Inez deserves a paragraph as does Lamont O’Neal as Seaweed Stubbs. Leffert’s set design and Butch Sager’s costumes are spot on. 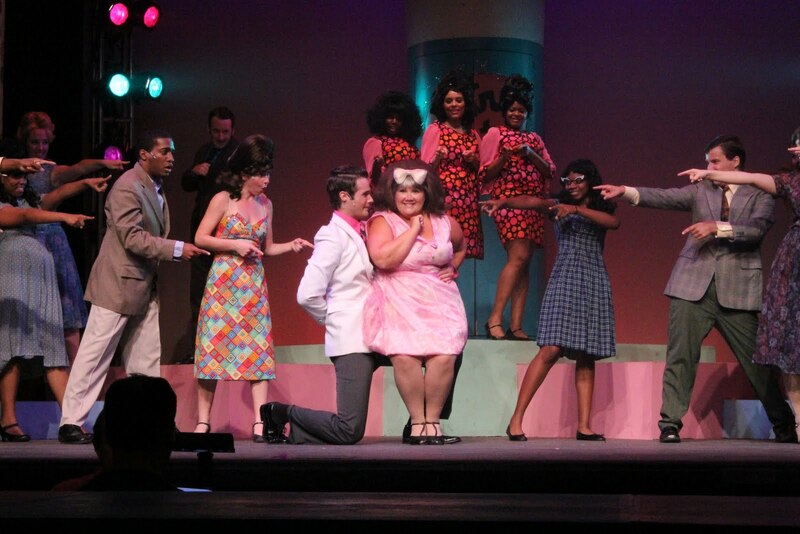 Hair Spray continues through July 24 at the Jewish Community Center, 3600 Dutchman’s Lane. The house on Thursday was nearly full and I’m given to understand ticket sales are strong, so if you want to see this Center Stage production you better call soon. You’ll be sorry you missed it. Theatre Review by Kate Barry: Fifth Third Bank’s "Dracula"